I've done an easy to navigate website version of DRL where you can at least more easily read the articles in the correct order which I've also now grouped into categories. You know I never really intended this to become what it has, even though my first posting, 'Mission Statement', did come true I didn't know at that time if I would be able to see it through. My original intention and first order of business was to archive the James Stinson interviews which were even then already disappearing on the web. Since then I feel like I have achieved a lot in my enquires and expended far more words than I could have ever imagined on a group that still remains essentially an enigma. It's well known that to immerse yourself in another subject which is separate from your day to day work life serves to re-energise your interest in the wider world. Certainly I have found this to be the case, for me its been great to take a break from my own concerns and delve into Drexciya's realm and I hope it has been the same for you also. Although like anything worthwhile it did take some effort at times which has borne some fruit in the discovery that there is indeed an important philosophical message contained in their music and mythos which is something we can take with us back into our everyday lives. I'd also like to thank everyone for reading thus far and anyone that improved my articles by sending additional information, respect. 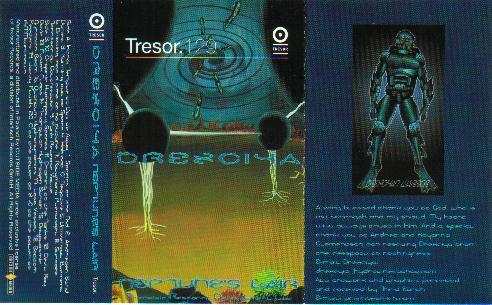 Drexciya’s ‘Neptune’s Lair’ album came out on the German label Tresor in 1999 after a two year break between records and production. The main change which occurred between then and now was that from now on they become albums orientated and concentrate on getting their music direct to their largest audience by working with a succession of European labels. This creative explosion would not become fully realised till the Storm series but the first fruits of that time are on display here. Tresor itself were at the time and continue to be one of the most successful European techno labels with a reputation for harder variety of the genre, although a closer inspection of their catalogue shows a broader taste. It came out of a club that first emerged after the fall of the Berlin Wall, establishing itself in the underground vault of a department store which had stood in the no-mans land between East and West Berlin. By 1999 Tresor had a long established connection with Detroit and had already worked most of its main players like Jeff Mills, UR and Juan Atkins to name but a few. 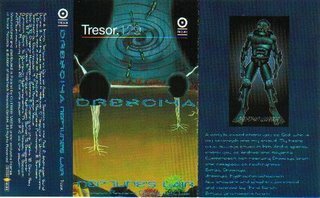 It should come as no surprise that they would now work with Drexciya whose music I must say does not exactly fit on this label but then again it never really fitted anywhere, at least on Tresor they would be exposed to a lot more people through a label with the best machinery to promote them. This really ties in with their ‘wave jumping’ idea of moving with ease from one label or scene to another, from Detroit techno, on to Berlin and right up to the new millennium cool of the Dutch Clone scene, they were always at the centre of it all. Before I go into what the themes of the album are I’ll simply tackle the most important aspect, the music, track by track in the order of the CD. The first sounds we hear after this lay off is the religiously grand, almost to the point of becoming comic, 'Intro: Temple of Dos de Agua'. With its backing track sounding like it could have come straight out of some not very good sci-fi film it also features two purposely unintelligible voices which are likely Gerald Donald and James Stinson themselves. Predictably the only recognisable word is ‘Drexciya’ amongst what at times sounds like it could be a made up or foreign language which would tie in with the Spanish sounding title. This all lasts for about a minute and sets the tone for a trippy and weird album by anyone’s standards which does not feature another vocal of any kind from this point on. The title could also be translated as being another way of saying the album title, referring to a place of worship of 'Him of the Water'. 'Species of the Pod' brings us back to familiar sounding territory at least. I guess it’s as good a fast paced dance-floor moment as they had done in the past but it tellingly, I think, breaks down towards the end as the tempo gradually and literally grinds to a halt. You will soon hear there are two extremes followed here and the next track ‘Andreaen Sand Dunes’ could be seen as one of these new visions we can be thankful they have still got their production eye firmly on the dance-floor. Easily my favourite on this album for sure and a good introduction for anyone wanting a taste of what this album has to offer. Lots of fresh new sounds but I think the quality of the song writing itself has gone up a whole new level here as well. ‘Running Out of Space’ keeps us on our toes and has a certain panicked feel that matches its title. But at just shy of the 2 minute mark it is a quick burst of energy before the first real twist this album has in store for us. ‘Habitat 'O' Negative’ begins slow and continues on its lethargic way as gradually snares and a loose bass line joins it and develops into the most alien of funk. This is also the first track that introduces their second new extreme. Again, after their long layoff what they bring to the table that is new on this album is two things. Their ‘Andreaen Sand Dunes’ type raising the bar of their production and song writing and also this beginning of them pushing the musical envelope. ’Habitat ’0’ Negative’ and the other tracks of its ilk here are Drexciya’s first brave and largely successful steps in this direction. While this latter course would turn out to be more of a detour than a career move, it is one side of their approach to this album. ‘Surface Terrestrial Colonisation’ is my second favourite on here. It has some great keyboard playing, live playing of course - no sequencing going on here - to its mid paced jaunty backing, which makes it very recognisably human. ‘Funk Release Valve’ is another quick but accessible burst of their brand of funk. ‘Organic Hydropoly Spores’ has a processional feel about it, but also through some strange alchemy of sound it has that special something deep in its very essence. Again not a very lengthy track but there’s just something in its basic loop that make it stand out as another high point for me. Again the title of ‘Draining of the Tanks’ was explained to some degree when James Stinson spoke of draining the tanks in regard to how he envisaged starting over again after the break after 'The Quest'. Very watery sounds churn around here with some keyboard backing. This could really have been used as a suitable intro to the album as well both sonically and conceptually. ‘Devil Ray Cove’ is easily the most brutal sounding track on here, even kicking off in classic hard techno style but quickly establishes some originality for itself. It’s certainly the most ‘Tresor’ moment here and I wonder if it was done with them in mind, as a sort of here’s our version of your sound. I would love to know if any DJ’s went as far as dropping it in the original Tresor clubs basement venue, I would have liked to see that. ‘Fusion Flats’ never really gets started as it shudders and thumps along for its duration of about a minute or so. ‘Triangular Hydrogen Strain’ is sublime. If the ‘Intro’ track might have been from a not very good sci-fi movie then this could have been from a very good one. It basically kicks along nicely with lovely smooth keyboard lines alongside more jagged beats. ‘Oxyplasmic Gyration Beam’ is more of a riff based track that loops along on its own pleasant groove. ‘Quantum Hydrodynamics’ is a melancholy short which not only shares a similarity in title to Gerald Donald’s ‘Quantum Transposition’, the name of his 2005 album as Der Zyklus but the music here is total Donald as well. Whether in 2005 he was purposely referring to this track or not he definitely knew where he was going at this stage. His other early foray into this sound is also from this same time period, ‘Gesamtkunstwerk’ found on the 1999 Dopplereffekt compilation of the same name. ‘Lost Vessel’ is yet another fast number with particularly good beats that could be hailed as yet another Drexciya classic. Really, it's a track like this that in the future will be forever dropped in some club or passed between friends on mixes that will truly build a legacy for them, a whole new generation that will only experience them through their music, their essence. 'Bottom Feeders' ricochets off in multiple directions using sounds that just shouldn't gel but somehow kind of work, a lot like the approach used later for L.I.FE. The penultimate ‘Jazzy Fluids’ sounds like it could be from another band entirely or at least an earlier incarnation as old school bass lines which sound very early electro, if it does have a precursor it’s early Paul Hardcastle when he was first mixing soul with electronics. Finally the album comes to a close with ‘0 to the Power of X+C to the Power of X=MM=Unknown’. which boasts tasteful and understated laid back synths that leads to a perfect ending of calm. There we have it, 21 tracks of end of the millennium techno from a truly reborn and re-energised group. In one respect the imagery used on 'Neptune's Lair' could be read as them living up to their reputation, a return to ground already covered and it is to an extent. I must admit I could not detect one definite theme in this case, there is however more of a variety to choose from with more details of the physics and biology of Drexciya being the more obvious in this ‘Scientific Research and Development Lab of an album. Stinson himself spoke of how this album has various themes, "If you look at the album there's a lot of different titles - the different elements that's on there - that go along with these concepts. We're developing a little mystery and the people kind of go along with that and follow it." I guess the main album title itself gives us our biggest grounding as far as understanding the album and it has a similar effect to ‘Deep Sea Dweller’ in that it gives us our location, one we have been at before of course, back to Drexciya but this time designated as ‘Neptunes Lair’. Neptune was of course the Greek God of the ocean and with so many thank you’s to him that have gone before I think it’s fitting that we are finally in the presence of one of his incarnations. But there is also a subtitle to the album we should consider, ‘Scientific Research Development Lab’. What sort of heaven is this then, where creation itself was founded and continues to be? Before I go too far down this road I’ll say that I don’t think Drexciya were thinking about a creator God here, it’s just another way to describe their undersea home, the research and development being carried out here being for the benefit of their own kind. There is also a quote in the artwork that reads, “Experiments must continue at all costs even if it means death.” This line has appeared before in ‘The Unknown Aquazone’ artwork but here we might be starting to understand what the nature of these experiments are. ‘Universal Element’ would be the most obvious answer and might refer to the ultimate aim of this research, a cosmic or atomic principle which unlocks everything, making us truly master of our universe, very much what alchemists have sought throughout the ages. Parallel with the science theme there is a lot of military imagery also, the drawing of the Drexciyan Warrior and the five other warrior types swimming towards us, two of which are armed with spear like weapons. This also has a precedent, on ‘Aquatic Invasion’ there are Drexciyan commandos but as I explained before the whole military thing in that case seems more to do with UR than anything. But here we have it really in our face, what is the conflict here? Maybe the track titles will explain? I did finally work out a possible scenario from a couple of titles which does tie in very much with the next album, ‘Harnessed The Storm’. I’ve spoken before of the paradise lost aspect of this album, its opening track being ‘Under Sea Disturbances’. Well here for the first time we may have a reason for what causes this exodus from paradise and necessitates the journey back to the Drexciya Home Universe. The conflict could be that the Drexciyans are somehow ‘Running out of Space’ and ‘Drifting into a time of No Future’. The seriousness of the situation being revealed in the message that ‘experiments must continue at all costs, even if it means death’. Quite why is not important as we deal here with metaphor, but obviously some sort of solution is now required. Maybe this album partly contemplates a number of those options, ‘Surface Terrestrial Colonisation’ could be a solution in moving over ground and talking over the surface world, that would certainly explain the military vibe. Or perhaps the discovery of the ‘Universal Element’ as mentioned would solve the problem in a less barbaric manner. To become a ‘Lost Vessel’ might be their great fear if they did indeed take the drastic step of leaving in search of their home universe. If I’m right on this they went on to take this brave course on the Storm series which in this context could be envisaged as a sea faring vessel lost in a storm. Although the whole thing would turn out to be a metaphor for a conflict with themselves as they fight that tendency we all have to take things for granted and becoming lazy, empires forever destined to fall and all that. Some more specific locales are revealed in the ‘Andreaen Sand Dunes’ or ‘Devil Ray Cove’, but this is where I’ll leave it as there really is so much going on here that could be interpreted from the titles alone and I believe I may have discovered the main connection which links this album with the following one and should leave it at that or else I may never finish this piece! The front cover image is an incredible painting done by Abdul Qadim Haqq of Third Earth Visuals. You'll find his signature in the lower right hand corner of the LP cover artwork. He is responsible for all the other artwork on the labels and the Drexciyan Cruiser etc as well. He is based in Detroit and has worked on music related projects since 1989 when he met Derrick May. He has also worked extensively for UR and many other techno labels and has today seen his work exhibited around the world. I have a link to his website as base of article. In the front cover image you can see what perhaps is ‘Organic Hydropoly Spores’ in the foreground and another massive one bordering the sides while Drexciyan Water cruisers emerge from what might be a hydro doorway behind. Also check out the red hills of Lardossa. Credit wise and sleeve note wise we fittingly get the biggest thank you to God yet, “A very blessed thank you to God who is my strength and my shield. My heart will always trust in him.” Certainly this sounds like Stinson being very grateful for regaining his health as well as completing his new album. An acknowledgement of a more Earth-bound variety but with possibly the same thing on his mind goes out to, “ Andrea and Kayanna Clementson for rescuing Drexciya from the cesspool of nothingness.” Of course we can only speculate on this and not forget that Gerald Donald is also to be considered, but there is certainly a lot of love and gratefulness going on here. Tresor would go on to release two 12”’s from this album, namely ‘Hydro Doorways’ which would include the remaining six tracks that didn’t make it onto the vinyl set of the album, only 'Jazzy Fluids' never made it to vinyl. The other was a remix of ‘Fusion Flats’ that featured the famous Detroit based Burdon brothers work in their Octave One and Kaotic Spatial Rhythm guises as well as a UR remix plus the original . Only the title ‘Hydro Doorways’ is new information and I like to think this tells us that they pick the option of going on their journey and go through these doors into space. One additional format of the album appeared in Poland as a cassette tape. I only know this as I bought one while I was there in 2001. For some reason tapes still sell here and Tresor licensed it to a company called Outside Media. I’ve no idea if you can still get it but I’ve scanned the sleeve image as a curiosity(on way, Blogger acting up), the track list is the same as the CD. Simply because of its format I ended up leaving it in my car for years and it inadvertently sound-tracked so many journeys for me that it triggers a lot of motion filled memories when I listen to it now. To sum up, Drexciya’s debut album after seven years of honing their skills is a triumph, so fresh and original even today. In so many ways it could have stood as their epitaph, as The Quest could also have done, but as we know they went further. 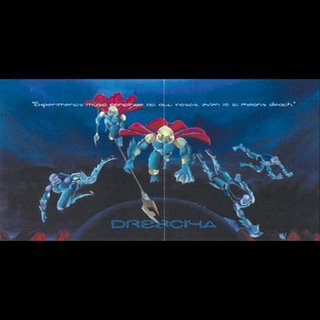 The memory of Drexciya will always stand as a victory for originality, imagination and independence. The last two posts have been taxing enough on me due to them both being about albums but I’m proud to have made it all the way from Drexciya’s beginnings to this point seven years later, with the remainder of their career already covered. Not that I won’t revisit this time and cover some of the loose ends but I’m planning to start covering some Gerald Donald activities next so that is where my mind will be for a while.